An Erie native, Steve earned his Doctorate of Physical Therapy from Gannon University in 2013 after completing a Bachelor of Science in Sport and Exercise Science, also from Gannon, in 2010. He worked as a physical therapy tech at Hertel & Brown for five years before joining the Hertel & Brown team as a licensed therapist upon graduation. 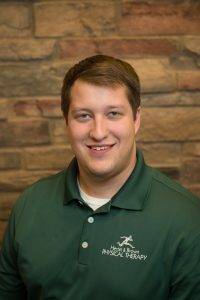 His areas of interest include the prevention and rehabilitation of sports injuries, vestibular/balance dysfunction, manual therapy, and the McKenzie Method, in which he has begun additional training. He also completed Level 1 certification in Fascial Movement Taping (FMT), also known as kinesiotaping.